I was busy and skipped June’s update so I’m providing an update for both June and July. I’m in the process of lowering my carbon footprint and at the same time saving money. I already mentioned using more energy efficient lighting (LED’s). As mentioned in a previous article, Why I’m Replacing All My Lights With LED’s, I picked up several LED lights from Amazon.com. I’ve now got a new plan up my sleeve to drastically lower my electric bill. I’ll mention this one later but I will say it involves my pool and should be in place by the end of the week. Keep in mind, all projected numbers were based on my original solar proposal by the installation company. So what has happened over the last two months? Well I’ve used a heck of a lot of electricity for one thing! I’ve used more than I did last year. Now just one year of increase isn’t a reason to panic. If a stock only had a two year streak of dividend raises, that’s not a lot of history to go off of. 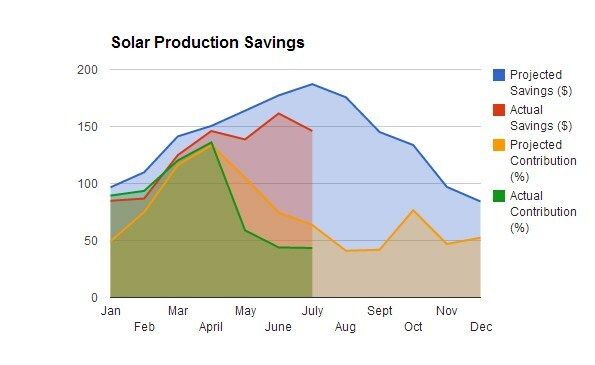 The good news is that I’ve saved a total of $727.29 from solar production so far this year. My projected savings has been higher than my actual savings (due to a drop of the amount of credit I’m receiving per kWh produced), so this month was no surprise. I did replace a faulty A/C coil two months ago. Who knows what my usage would have been without that. I have a new plan up my sleeve to drastically lower the biggest energy hog at my house. That’s my pool! Until I got the electric monitoring system, I would have thought my A/C would have accounted for the highest energy usage. I was wrong! The rough breakdown is 50% pool / 40% A/C / 10% everything else. So I haven’t been able to beat my usage from a year ago the last few months. I’m hoping I can change that in August. 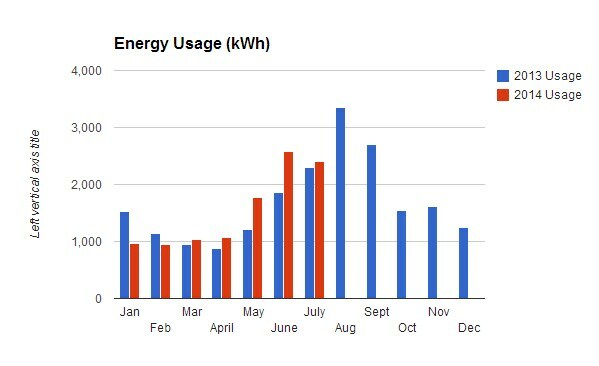 Last year August was my largest energy usage month, coming in at a whopping 3346 Kwh, over 1000 Kwh more than July! With a partial month of reduced pool energy usage, I should be able to do much better this month. I plan to continue tracking these stats for an entire year. This is still a learning process for me but I am happy I went solar and I’m hoping these results will influence others to also go solar. A relative was looking to get solar added to his home, he was told that he would get monthly credit for the power that he would generate. If he generated more that he used, he would receive a credit balance. He was then told that if he ran a credit at the end of the ‘year’ (annual billing cycle) that the credit would reset to zero and they would start over. No excess money paid to the homeowner. So he was told that he should only get a big enough system to basically match what he was using. That seems like a flaky system to me, why shouldn’t you get paid out what you have been able to generate? Is this how your utility system works? You just described my exact scenario. However, the months that I produce more than I consume are in the spring and those credits get eaten up in the summer. Winter is a low producing time and usage so far has exceeded any production in December. Therefore, I haven’t had to worry about losing credits. You are correct about not getting an excessive system though, as that could cause you to lose credits. So far I’ve received all of mine but I’ll be sure and keep track. 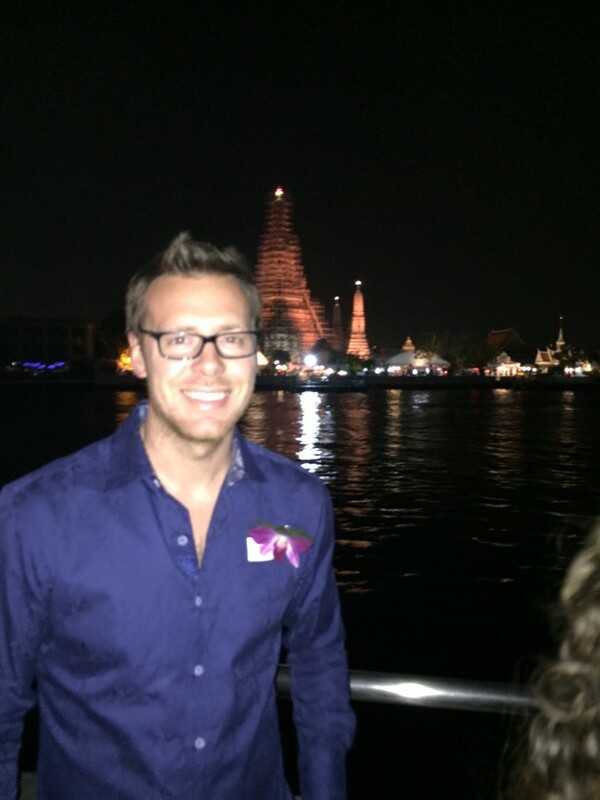 FerdiS recently posted…What is a Liebster Award? Thanks for the nomination. I’m so happy to have given you motivation! That’s one reason I like to blog. I’m going to have to post an article now. You and Asset Grinder have both nominated me. Plus I’ve had fun reader other peoples’ responses. I’ll try to get this out by the end of the weekend. But it seems like you have gotten an excellent deal with the utility company, it appears to just be a City program when looking at your article. You know, the way to get rich is to take advantage of the opportunities that are available, and I think you were smart to do this give the incentives in your area. Yes, sun would be a definite requirement lol. I also have a lot of trees but my house is two story so it’s high enough to get the sun. Between lots of sun and a huge rebate from my city, it was a no-brainer for me here. I think it cost me about 8k for a $30k system after local and federal rebates. I believe the federal rebate saved me close to 7k, that one is available to anyone. My break-even is about 7 years or less. Love the solar updates. Would love to see the pool stats too once available. I always wanted a pool but I know I would hate the maintenance and cost. I’m glad you like these. It’s still a work in progress but I’m doing everything I can to lower my bills. I can’t separate the pool usage from other usage but I should be able to see a big difference on my bill. I’m hoping to also see a big difference when looking at my electric monitoring software. I can probably post a new chart of that. Eventually I’d like to do all the maintenance myself and save myself even more money. It’s definitely a lot of work and money to keep a pool! By the way, I’m working on answering you Liebster questions and will have a post out by the weekend.